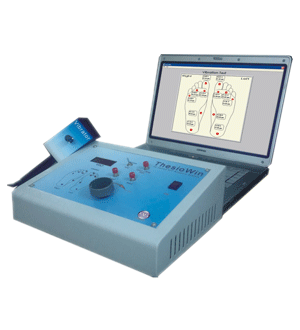 ThesioWIN is an easy to operate Digital Vibratory Perception Threshold Analysis System. It can be used both in standalone and PC based mode. Loss of sensation due to Neuropathy is the major cause of painless injuries to the feet. Such injuries result into chronic ulcerations and complications leading to large amputations. Hence, early and accurate detection of sensation loss due to neuropathy is the best way to protect the feet from amputation. Also, it is very important to quantify sensation loss risk to monitor the trend by follow up. Thesiowin serves in both ways. The Vibratory Perception Threshold at various sites on planter foot quantifies the loss of sensation. Increase in VPT means diminished sensation and increasing risk. When used in PC mode, a tabular trend of VPT is available. A sophisticated vibration mechanism virtually eliminates the possibility of pressure dependency of VPT.